Warren players congratulate Kiersten Hoffman (13) as she crosses the plate following a solo homerun during the fourth inning of a game against Titusville at Legion Field, Thursday, April 11, 2019. Hoffman’s blast was the first of seven runs in the inning and the Dragons went on to win, 10-0. 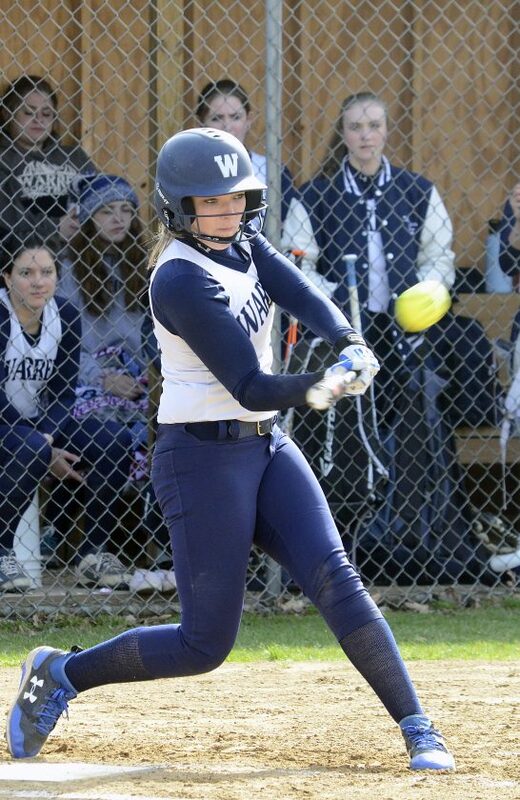 Through three innings Thursday, the Warren softball team had collected just three hits and was clinging to a 1-0 lead over visiting Titusville. 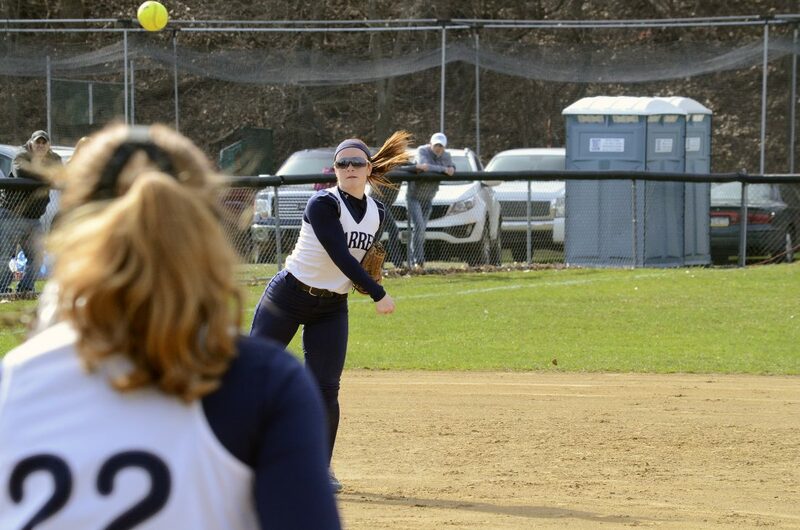 Kiersten Hoffman led off the bottom of the fourth inning and blasted a 1-1 pitch over the left-centerfield fence and sparked a 7-run outburst that led to a 10-0, five-inning win over the Rockets. The offensive production backed a no-hitter from pitcher Ellie Lobdell — her second in a week. After being stymied for most of the first three innings, the Dragons offense produced a big innning for the second consecutive day. 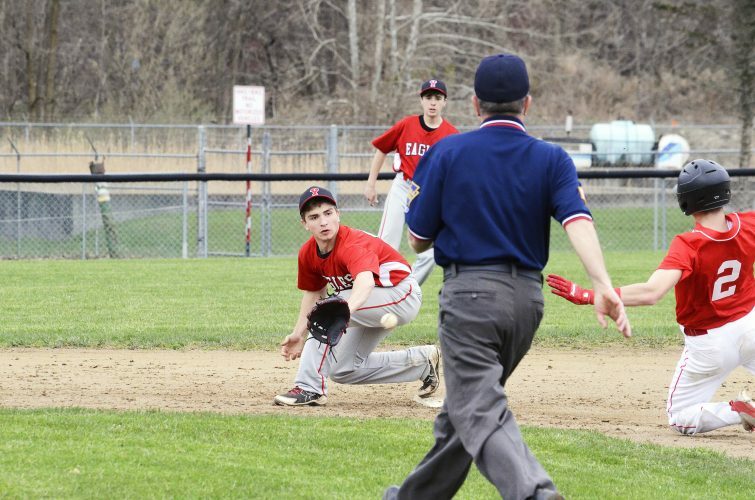 Warren had a 10-run fourth at Slippery Rock Wednesday. The Dragons (4-1) grabbed a 1-0 lead in the first. Celia Chase stepped in with two away and fell behind 0-2. She fouled off a number of pitches, but the ball hit her finger on one and freshman Alix Lytle had to step in to finish the at-bat. Lytle worked the count to 2-2, then sent the next pitch to the centerfield fence for a double. Warren’s Kiersten Hoffman squares up a pitch during the fourth inning of a game against Titusville at Legion Field, Thursday, April 11, 2019. Hoffman drove the ball well over the fence in left-center for a solo home run. Warren had a pair of injury scares in the inning. First, the hit to Chase’s finger, then Hoffman collided with one of the Rockets while stealing second. Both Dragons were able to stay in the game. The Dragons looked poised to add to their total in the third. Morgan Munksgard hit a line drive to left. The ball bounced off the left fielder’s glove and rolled to the fence. Munksgard found herself on third with no outs, but was stranded there and Warren took the 1-0 lead into the fourth. Ellie Lobdell reached on an error following Hoffman’s homer and Gracie Wood sac bunted Lobdell to second. Kelsey Stuart reached on an error and Grace Wortman was hit by a pitch to load the bases. Munksgard ripped a 2-run double to put Warren up 4-0. Lex Nyquist hit a RBI single to left and an error allowed a second run to score and Nyquist to advance to third. Julia Lobdell’s squeeze bunt scored a charging Nyquist and the Dragons suddenly had a 7-0 lead. One out later, Hoffman reached on an error and another run came across. Ellie Lobdell struck out the side in the top of the fifth, and the Dragons offense went right back to work in the home half. With one out, Stuart reached on an error and advanced to second on the play. Wortman singled to center and the centerfielder bobbled the ball which allowed Stuart to come across. Meredith Morrison came in for Wortman as a courtesy runner and just beat the throw home on Munksgard’s line drive single to end the game. Hoffman and Munksgard each had a pair of hits with Munksgard driving in three and Hoffman two. 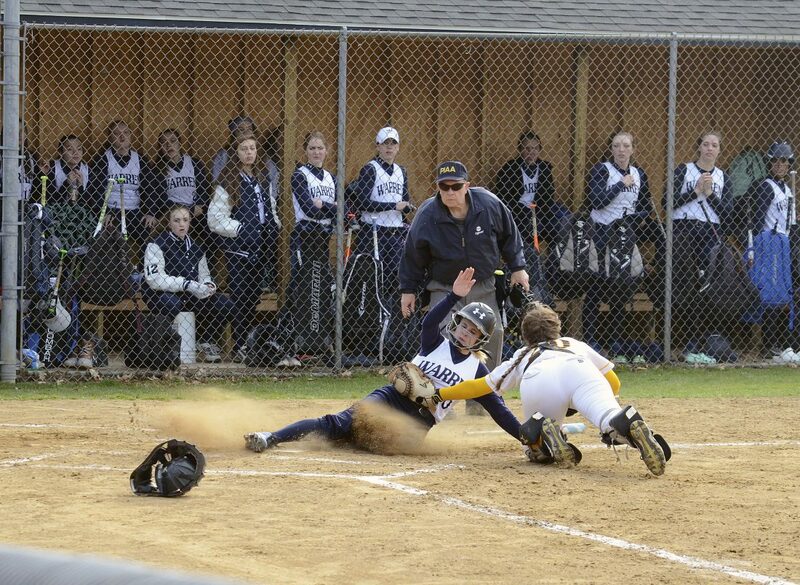 Warren’s Meredith Morrison (0) slides across the plate just in front of the tag of Titsuville catcher Amber Scott (20) during the fifth inning of their game at Legion Field, Thursday, April 11, 2019. Morrison’s run was the deciding run in a 10-0, five inning win for the Dragons. Ellie Lobdell went five no-hit innings. She walked two and struck out 10. 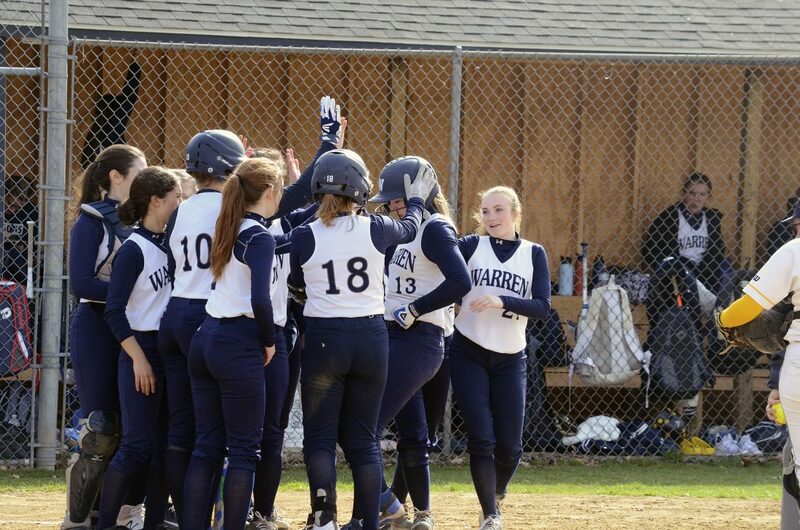 “Ellie was in command and it was nice to see with our bats getting a late start,” said Warren coach Jon Sitler. “All of her pitches were working, and she is heating up as the weather is heating up. Kiersten’s bat has been hot as well, and her homer couldn’t have come at a better time. It was nice to see us adjust for the second day in a row. We are aggressive. At the plate and on the bases. 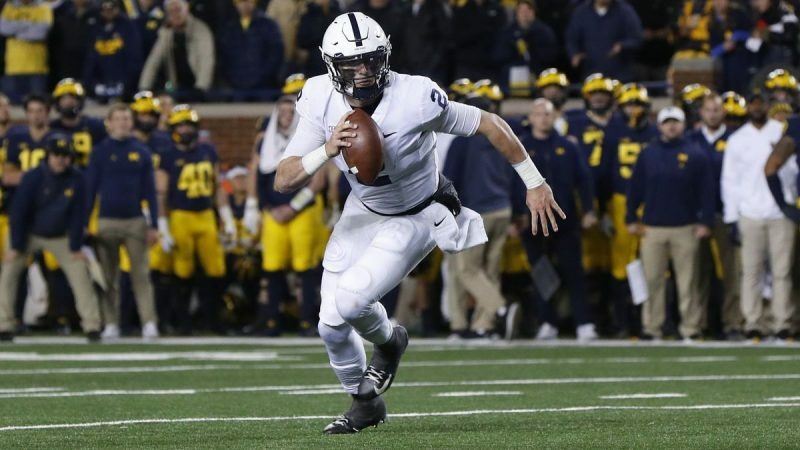 We — all the coaches — believe in each and every player, and we told them that tonight. We always believe it’s not a matter of ‘if,’ but ‘when.’ That was certainly the case the past two days. Warren is back in action Saturday. The Dragons host Slippery Rock as part of a softball/baseball doubleheader with the Rockets. The first pitch for both games was pushed from noon to 1 p.m.
Warren shortstop Lex Nyquist (5) fires to first baseman Celia Chase (22) for an out during a game against Titusville at Legion Field, Thursday, April 11, 2019. The Dragons defeated the Rockets, 10-0, in five innings. DP-None. 2b-Lytle (W), Munksgard (W). HR-Hoffman (W). SB-Hoffman (W). Sheffield’s Delentay Walker (left) edges Johnsonburg’s Cole Secco in the 100 meter dash during Thursday’s meet against Johnsonburg on Wolverine Mountain. Sheffield’s Kyra Wotorson runs the anchor leg of the 4×100 relay on Thursday against Johnsonburg. Wotorson also took home a first-place in the high jump for the Wolverines. Sheffield’s Annabel Sheldon lands after leaping in the long jump during Thursday’s meet against Johnsonburg. Sheffield’s Caden Smead (right) races to victory in the 400. Sheffield’s Emily Leichtenberger gets set to throw the discus during Thursday’s meet against Johnsonburg on Wolverine Mountain. Leichtenberger won the event, as well as the shot put, and finished second in the javelin.